The Child Protection Department at the Mae Tao Clinc critical shortfalls in their budget! While we cannot make up all the shortfall, with your help we can make up some of it. All monies raised here will go to support the Child Protection Department. I will personally pay all fees related to your donations. If you donate $100 then $100 will be given to the Mae Tao Clinic. This will help support their dry food program, ensuring school children have at least one meal a day. Many children are from extremely poor migrant families, so do not have the ability to purchase food! We try to give them one meal a day while they are in the Mae Tao Clinic’s Child Development Center. Read more at Mae Tao Clinic’s website. Your donation will also support the birth registration program. Children who are born of migrant families and whose births are not registered are stateless! Stateless children are the most venerable to human trafficking! This fundraising project is part of the Chiang Mai International Rotary Club’s (CMIRC) campaign. You may be comforted that your hard-earned money will go exactly where it is intend to go. Each donor will be receiving a copy of the financial report from this campaign. Below is a brief extract from Mae Tao |Clinic asking for donations. Also please see Mae Tao Clinic 's website for more information. Please be generous and donate just a bit more than you think you can afford, and please pass this on to your kind and generous friends. A quote from our most recent donor. "I am supporting a very important cause: having visited the Mae Tao Clinic and the Child Development Centre there, it is plain to see the earnest efforts under way and some of their success. My best wishes for the future". If we can raise just another $540 (17,500) THB we can fund 4 G.E.D. students at BEAM for their G.E.D. study and examination. That's just 11 more donors at $50. Please help by making a donation and sharing this with your kind and generous friends! What a fantastic way to end the year!! Happy Holidays! We are close to reaching a combined goal that will provide G.E.D. scholarships for 3 students. We only need to raise an additional $690 to reach that goal. Please help with a donation of any amount and please pass this on to your kind and generous friends. 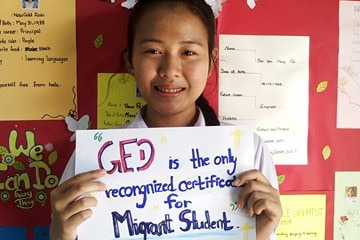 Per agreement with the Mae Tao Clinic the funds from this campaign will go to support GED scholarships. Also the campaign will close at the end of the year. Please pass this on to your generous and kind friends who know that there is hope in sustainability and that the most sustainable gift you can give is Education! It would be marvelous if we could raise another $500. Any donation of any amount will be greatly appreciated!